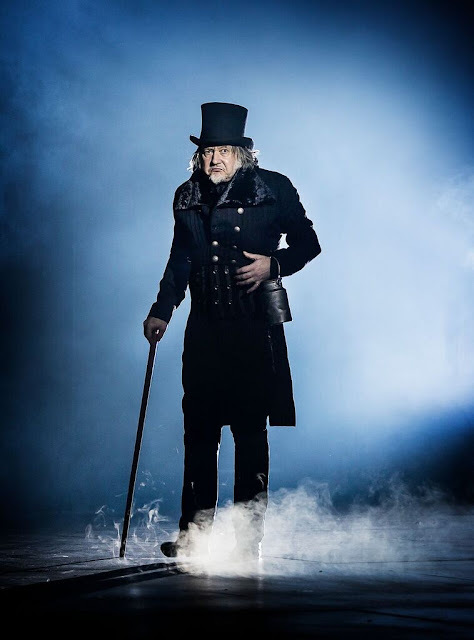 Scrooge The Musical | Curve Theatre, Leicester. A Christmas Carol is without a doubt one of the most iconic stories written by Charles Dickens. There have been many adaptions of the story over the years, all of which have contributed to a much loved story and equally one of my favourite stories to tuck into over the Christmas period. 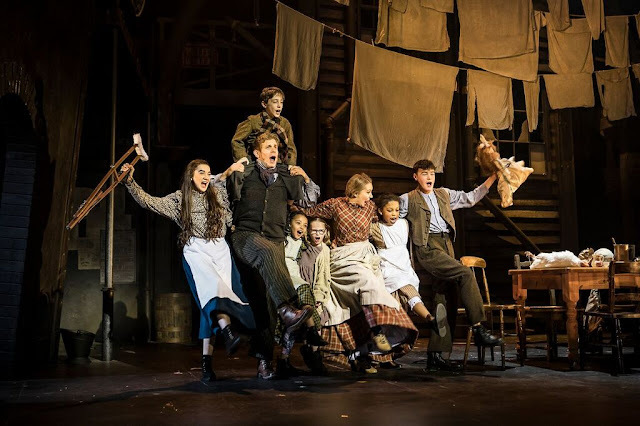 Curve's growing tradition Made At Curve productions over the years are really bringing the Leicester theatre to the forefront of the theatre scene outside of London's West End. This latest partnership see's the theatre's Artistic Director Nikolai Foster and producers Michael Harrison and David Ian to bring a carefully crafted new take on the Leslie Bricusse show. With a story that has been re-created many times before this Made at Curve production definitely does come up as one of the best it has been. It definitely everything you need for a right festive affair this Christmas. Curve's newly announced Board Member Jasper Britton leads the cast in the title role. He completely captivities the character of Ebenezer Scrooge, blending through the various emotions from his character. Whilst his singing is probably the only flaw, his obvious strength in acting makes him for the ideal person for the role. You have to admire his ability to completely command the role when he's in it pretty much from beginning to end. Ebenezer is visited by the spirit of his dead business partner Jacob Marley and then the three ghosts of Christmas Past, Present and Future, in a bid for him to redeem himself. As a collective three ghosts and Marley really bring to life the haunting atmospheric tones of the story. Whilst there is no co-leading roles within this production, the ensemble are of gorgeous quality. Within the company notably, there's a lot of doubling up in roles that work so well. Lauren Stoud doubles up as both the finacee of the young Ebenezer as well as the current wife of his nephew Harry. Fresh from Eastenders, Danny-Boy Hatchard really took me by surprise as local lad Tom Jenkins. His performance is particularly striking and would be great to see him take on more musical theatre in the future, he's definitely one to watch. 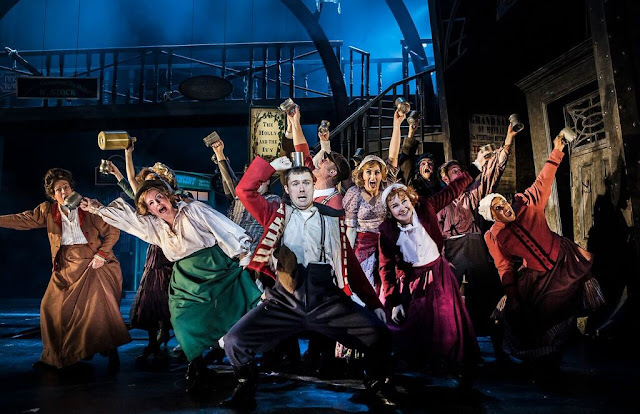 What really brings the musical to life is the spectacle of the choreography, local award-winning choreographer Stephen Mear gives the musical just what it needs. Undoubtedly musical number 'Thank You Very Much' was my favourite of the night. The Toy Ballet was another particular routine that I loved, his polished and emphasised choreography really brought the vast space on the stage to life. 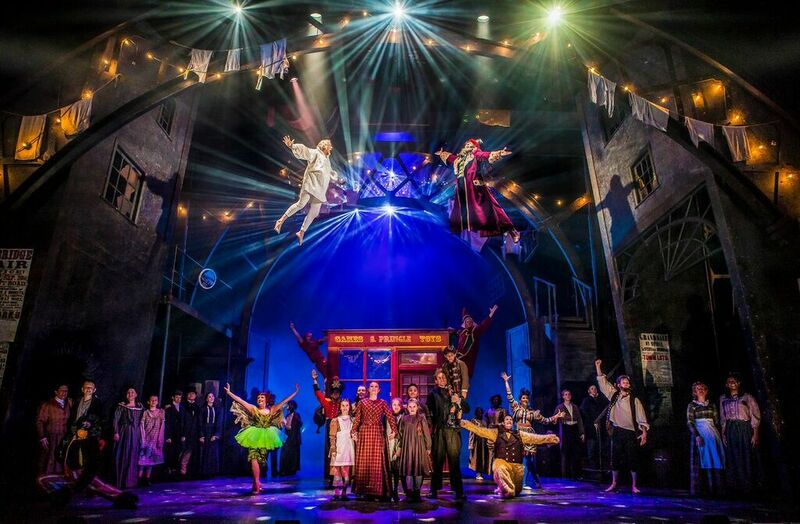 Curve's vast stage space is channelled to it's best in this production to great effect for Scrooge The Musical. The focal point is a gorgeous back-street setting, framed by a mighty archway and a bridge. It's all in the detail with fairground posters hung on the walls and clothes hanging out to dry. The production and lighting design definitely outshines any of Curve's previous productions and for that alone it's a Christmas spectacle in itself. Ben Cracknell and Michael Taylor have really outdone themselves with this one. There are some moments in the show that will wow even the youngest of audience members. What I loved most about this production was that they didn't stray away from the spooky foundations of the story. This was up there as one of my favourite productions MadeAtCurve has produced so far. I would definitely be aware that parts of the musical can be slightly scary so this isn't for every young audience member but it's more than worth a trip to the theatre this Christmas. There's so much more I can say about this musical without waffling on, so go and see it for yourself. If you'd like this review you can read my Interview with Stephen Mear, choreographer of this production.